Blue eyes: Is everyone with blue eyes related? Among human beings, blue eyes are less common than brown eyes. This is one reason that blue color contact lenses are popular. It appears that a genetic mutation in a single individual in Europe 6,000 to 10,000 years ago led to the development of blue eyes, according to researchers at the University of Copenhagen . "Originally, we all had brown eyes," said Hans Eiberg, associate professor in the Department of Cellular and Molecular Medicine at the university and lead author of the study. "But a genetic mutation affecting the OCA2 gene in our chromosomes resulted in the creation of a 'switch,' which literally turned off the ability to produce brown eyes." Eye color depends on the amount of a single type of pigment (called melanin) in the iris of the eye. This genetic switch, located in the gene next to the OCA2 gene, limits the production of melanin in the iris — effectively "diluting" brown eyes to blue. In addition to having significantly less melanin in their iris than people with brown eyes, hazel eyes or green eyes, blue-eyed individuals have only a small degree of variation in their genetic coding for melanin production. Brown-eyed individuals, on the other hand, have considerable individual variation in the area of their DNA that controls melanin production. "From this we can conclude that all blue-eyed individuals are linked to the same ancestor," said Eiberg. "They have all inherited the same switch at exactly the same spot in their DNA." So if blue eyes are the result of a genetic mutation in a single individual, how did the trait spread from just one person to being present in 20 to 40 percent of the populations of some European countries today? As mentioned above, blue eye color is determined by something called melanin. Melanin is a brown pigment that controls the color of our skin, eyes and hair. The color of our eyes depends on how much melanin is present in the iris. There's only brown pigment in the eye — there is no hazel pigment or green pigment or blue pigment. Brown eyes have the highest amount of melanin in the iris, and blue eyes have the least. At one time, it was believed that eye color — including blue eyes — was a simple genetic trait, and therefore you could predict a child's eye color if you knew the color of the parents' eyes and perhaps the color of the grandparents' eyes. But geneticists now know that eye color is influenced by as many as 16 different genes to some degree — not just one or two genes as once thought. Also, the anatomic structure of the iris can affect eye color to some degree. So it's impossible to know for sure if your children will have blue eyes. Even if you and your mate both have blue eyes, that's no guarantee your child's eyes will also be blue. The human eye does not have its full adult amount of pigment at birth. Because of this, many babies have blue eyes, but their eye color changes as the eye develops during early childhood and more melanin is produced in the iris. So don't be concerned if your child begins to lose that "baby blue" eye color and her eyes become green or hazel or brown as she gets a little older. Melanin in the iris of the eye appears to help protect the back of the eye from damage caused by UV radiation and high-energy visible ("blue") light from sunlight and artificial sources of these rays. Because blue eyes contain less melanin than green, hazel or brown eyes, they may be more susceptible to damage from UV and blue light. Regarding connections between eye color and eye diseases, research has shown darker iris color is associated with an increased risk of cataract and a reduced risk of ocular uveal melanoma (a form of eye cancer), compared with blue eyes. But the same analysis of published studies failed to confirm any association of eye color with increased risk of age-related macular degeneration (AMD). Still, because many people with blue eye color are sensitive to light and may have more risk of damage to their retinas from UV light, most eye doctors recommend that people with blue eyes should be extra cautious regarding their exposure to sunlight. And because eye damage from UV and blue light appears to be related to your lifetime exposure to these rays, wearing sunglasses that block 100 percent UV and most blue light should begin as soon as possible in childhood. Photochromic lenses are another great way to protect blue eyes from UV radiation. These clear lenses block 100 percent UV both indoors and outside, and darken automatically in response to sunlight when you go outdoors so you don't have to carry a separate pair of sunglasses. Also, adding anti-reflective coating to photochromic lenses gives you the best vision and comfort in all lighting conditions (including driving at night) while showcasing your blue eyes with reflection-free lenses. AR coating is recommended for all types of eyeglass lenses — including single vision, bifocal and progressive lenses — to eliminate distracting reflections and allow people to see the beauty and expressiveness of your eyes. Also, if you spend several hours a day using a computer, smartphone or other digital devices, it's a good idea to wear eyeglasses that shield your eyes from high-energy blue light when using these devices. It may take many years before we know the risks associated with cumulative exposure to blue light from computers and smart phones. 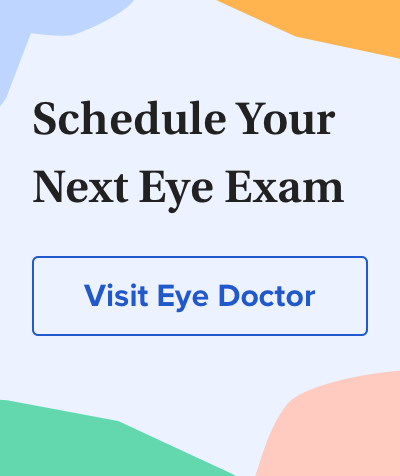 But many eye care professionals believe it's prudent to use caution when it comes to protecting your eyes from these devices — especially if you have blue eyes. A final note about blue eyes you might find interesting: Research suggests that having blue eyes may increase your risk of alcohol dependency if you are a drinker. A study of European Americans with blue eyes found people with these characteristics had up to 83 percent higher odds of becoming dependent on alcohol, compared with matched controls who had darker eye color.